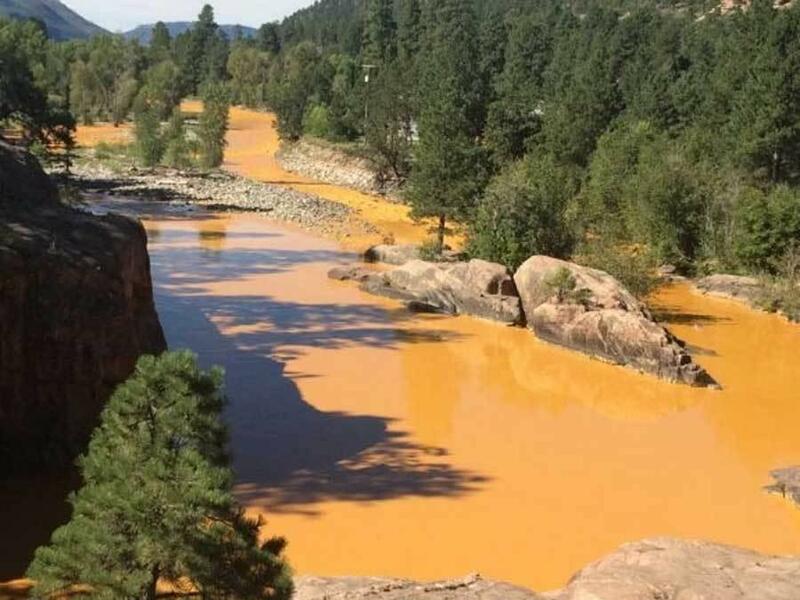 The Environmental Protection Agency was attempting to clean up the Gold King Mine safety deficiencies, and leaks accidentally ruptured a weak section of contaminated tailings and flooded the Animas River near Durango, Colorado with toxic wastewater in August 2015. Eventually, the toxicity killed every fish, and all streamside flora, and fauna: Photo Credit La Plata County – a commons image. The following excerpts from the article originally published by Center for Public Integrity, in partnership with Mother Jones, and part of High Country News’ Climate Desk collaboration. 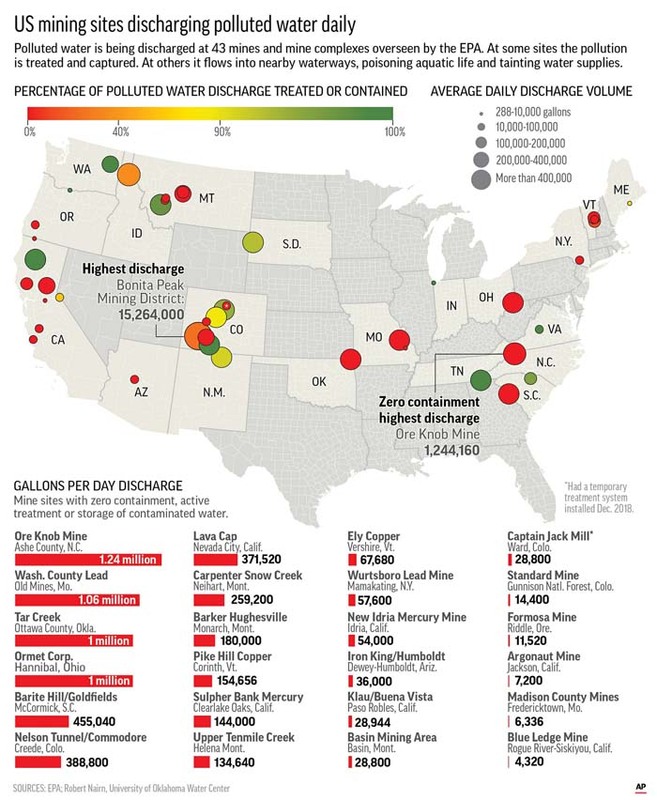 Graphic looks at polluted water discharge flow and levels of treatment of polluted discharge at 43 sites. Breakdown of discharge for sites with zero treatment or storage of contaminated water. AP chart. The remnants of an abandoned gold and silver mine scar the Little Rocky Mountains just south of the Fort Belknap Indian Community in Montana, bleeding polluted orange water into streams. Pegasus Gold Corp., a Canadian company that owned that mine and several others in the state, went bankrupt and folded 20 years ago. That left a legacy of water pollution and a cleanup bill nearing $100 million — with no end in sight. 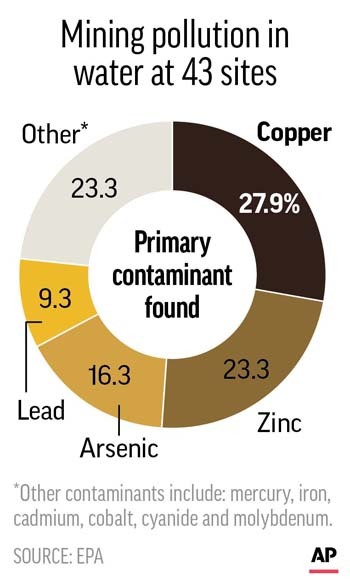 Chart shows the different types of pollutants found in the water at 43 U.S. mining sites. AP chart.